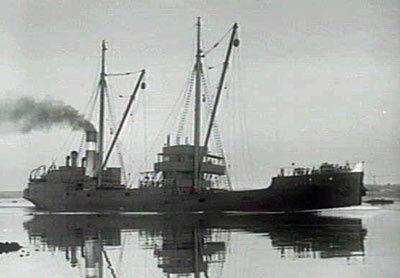 Michael McFadyen's Scuba Diving - SS Minmi The SS Minmi was built at Meadowside, Glasgow, Scotland for J & A Brown and Abermain & Seaham Collieries Ltd in 1927. The new vessel was 75 metres long and displaced 1,455 tons and was registered at Newcastle, NSW, Lloyds Number 128795. She was owned by J & A Brown and Abermain Seaham Colleries. 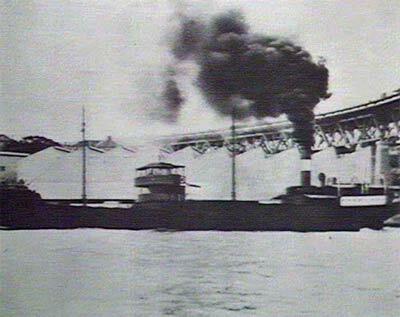 A collier, she was named after either the Lower Hunter Valley town of Minmi or the nearby Minmi Colliery (most likely as the colliery was owned by J & A Brown). The Minmi's main route was between Newcastle and Melbourne, carrying coal on the southward trip and returning empty. On Saturday 8 May 1937 the Minmi left Melbourne to return to Newcastle. At about 8 pm on 13 May 1937 she passed by Port Kembla. At this time Captain Robert Clark Callum (usually the Chief Officer - the normal Captain, J. McPhail, was on leave in Melbourne) and the Second Officer, C. L. W. Jones set their usual course which should have taken them three miles off Cape Banks at the mouth of Botany Bay. There was an incoming tide and the sea was from the starboard side. Just after 10 pm the Minmi was off Botany Bay to the south of Sydney. The seas were reported to be "fairly heavy" and a dense fog covered the shore and nearby sea. At 10.15 pm the ship struck the outside of Cape Banks, the outer northern headland of Botany Bay. It was reported that at 10.30 pm, soldiers at the nearby Cape Banks artillery garrison were awoken by the sound of escaping steam. They rushed out and saw the ship hard up on the rocks and soon distress flares were seen. The Police were telephoned and rocket firing equipment was requested. Soon after hitting the rocks, the ship's cook, Frederick Boulton (or Bolton), 40, suddenly collapsed into the arms of the third mate and died immediately of a heart attack. Mr Boulton was a veteran of the Great War and was said to have been blown up twice. At 12 midnight another ship passed by without seeing the wreck and 15 minutes later the pilot vessel Captain Cook arrived on the scene but it was too rough for her to get too close to the Minmi to launch a rescue bid. The 26 crew were trapped on the vessel, unable to get off due to the rough seas. At about 12.45 am the ship suddenly lurched and broke her back, splitting into two just in front of the funnel. The stern section, with nine or ten men on board, slewed around and broke free of the front of the ship. The funnel and mast swayed dramatically, the mast held in place by the stays. As the break between the two sections increased, it became very dangerous for the crew as the aft of the ship rolled 30 degrees as every wave hit it. The funnel almost came loose, threatening to hit the crew who were holding on for their very lives. It is unclear from newspaper reports, but it appears that 15 or 17 men were trapped on the front section of the ship. A line was shot across to the shore from the wreck behind a rocket. Aheavier line was then pulled over. One by one the men hauled themselves ashore along the line. They were all rescued, apparently without too much incident, although some were cut on the rocks. Many attempts were made to rescue the crew from the rear section. A rope was thrown across from the shore and tied off to an iron stanchion and 90 feet away on the rock platform, the other end was held by 10 or 12 men. Working by the light of torches, the rescuers were frequently washed from their feet by huge waves. One by one, the men used the rope to haul themselves to safety. Even the strongest and youngest found the going very hard. The rope whipped up and down as the ship rolled back and forth, the line taut one second and then slack the next. As the men neared the shore, the line would go slack and they would be bashed onto the rocks amongst the breakers. The rescuers rushed to help pull the men to safety, both at times being rolled over across the barnacle covered rock platform. Four men were rescued and the fifth fell into the surf, disappearing from view. The rescuers jumped into the water and pulled him out of a large pool. He was cut rather badly on his legs, his pants ripped to pieces. The sixth person, Robert (Bob) Burnside, was coming along the rope and he nearly made it to safety when a very big wave hit the ship and the line went tight. He was flung back along the rope but miraculously held on to the line. He became weak and lost grip with his hands. He was now hanging by his feet. Another huge wave hit the vessel and Mr Burnside was thrown into the air and into the wave as it passed under him. He disappeared from view and then his head bobbed back above the raging water. He was seen a couple of times and attempts were made to throw him a line. These failed. Yet another huge wave hit him and he was dragged towards the broken section of the ship. He was never seen again. Mr Burnside, 45, was married with two children. By now the back section was completely free from the bow section and therefore rolling even more when hit by a wave. The next person to attempt to flee the ship was Thomas William Skye, the mate. He slid 30 feet along the line but a wave hit the ship, the line went slack and he was dipped into the water. The next moment he was lifted high, losing his grip. Like Mr Burnside, he had his legs wrapped around the rope but suddenly he was flung into the air and he fell into the water. The wave took him out towards the ship but the next one carried him onto a break in the rocks where he was propelled around in circles by the sea. Another wave pushed him onto a rock and Mr Skye held on for dear life. A rope was thrown to him and he held on long enough to be lifted six feet where rescuers grapped hold of him and dragged him to the top of the rock. An enormous wave, said to be one of the biggest of the night, hit Mr Skye and the rescuers, knocking them all off their feet. They were washed all over the place but amazingly they managed to hold on to anything available, each other, the rope or the rocks and no-one was washed back into the ocean. Mr Skye reported that the remaining men on the rear section were old and "will never make it". Detective-Sergeant McRae of the Eastern Wireless Patrol, who was in charge of the rescue, decided that it was too dangerous to attempt to rescue the remaining three men, two of whome who were over 60 years of age. They were rescued the next morning in daylight (see names below: Styles, Smith and McGowan). At dawn, some fire brigade officers went aboard the wreck. They were under the direction of District Officer Griffiths and accompanied by Captain Callum. They lowered Mr Boulton's body over the side and brought it ashore. The wireless set and compass were also salvaged at the same time. Sydney again turned out to look at a shipwreck on its eastern shore. Just under six years earlier an enormous crowd had turned out to see the wreckage of the MV Malabar. It was estimated that 40,000 people trekked out to La Perouse on Saturday 15 May 1937 and 60,000 on the Sunday. Six Police were on point duty at La Perouse and shifts of eight Police guarded the cliffs. It was reported that at 4pm on Sunday cars were banked up for four miles along Bunnerong Road (now Anzac Parade and Bunnerong Road) towards the city. The Sydney Morning Herald reported that "an army of pie sellers, hot-dog merchants, ice-cream sellers and also beggars of various descriptions lined the route". The location of the wreck meant that the easiest way to get to the wreck meant that the sightseers had to cross the New South Wales Golf Course. The Club used caddies (hired for a total of £5 on Sunday morning) to protect the course's greens but the players were so overwhelmed by the people, they gave up on playing golf. It was estimated that 20,000 people crossed the course, causing damage of between £60 and £70. The wreck was sold for £200 to salvagers Penguin Ltd. This is presumably the same company (Penguin Salvage Co.) that purchased the salvage rights to the MV Malabar. They started work on the Sunday morning and at the same time, the Minmi's crew salvaged what they could of their personal belongings. The salvage crew of 11, with a cook, lived in shelters they erected in caves at the scene. By Tuesday they had recovered winches, steering gear, the compass and other pieces from the front section. It was reported that the lifeboats and fittings were damaged and that the aft section still could not be accessed. On Thursday 3 and Friday 4 June 1937, huge seas battered the wreck. During this, the aft section disappeared and was said to have "disappeared in deep water". One item that appears to have been salvaged was the ship's clock. It was made by Whyte Thomson and Co of Glasgow and was brass, looking a bit like a porthole. It is now owned by Dale Curry of Adelaide, South Australia. There is a bell of the Minmi now housed in the bar of the New South Wales Golf Club. 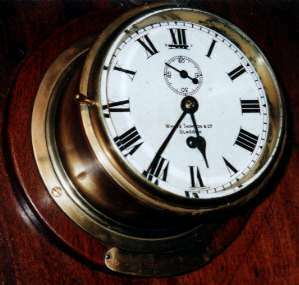 They also have a clock that staff say is the ship's clock but it is not a ship's clock. It appears to be a memento. 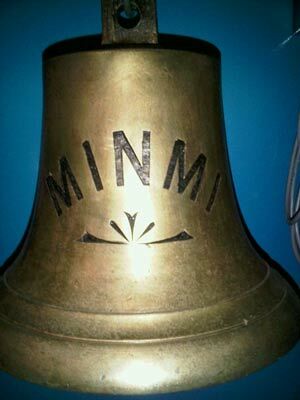 There is another bell from the Minmi located in the Newcastle Maritime Museum. 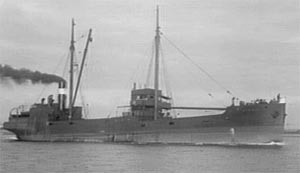 On 26 May 1937 the Commonwealth Court of Marine Inquiry, presided over by Mr G. A. Stevenson with Captains Day and Howell as assessors, exonerated the Master of the SS Minmi Captain Robert Callum, of neglect of duty. He had been charged with failing in his duty to navigate the ship safely. Late evidence presented to the Court came from Captain Callum's deviation book which was only recovered from the wreck on Saturday 22 May. This showed that Captain Callum had set a course to pass 2.5 miles off Cape Banks, a distance that was considered to be safe. Thomas Sparks, 19, who was only engaged on the ship on 30 April 1937, was officially discharged from the ship on 14 May 1937. Nowadays, the largest section of the wreck of the SS Minmi is the stern section which sits up on the rock platform, albeit on the inside of Cape Banks rather than the outside where it originally hit. The bay inside Cape Banks, Cruwee Cove (also called Pussycat Bay - so called because the bay looks like the head of a cat when viewed from the high section of the golf course) is littered with pieces of wreckage, although there is nothing but girders and plates to be seen. There must be other sections of the wreck (for example the boiler, engine, prop etc) located off the rock platform but I have yet to find them. I suspect that they are in shallow water near where the ship hit the rocks. Email from Ray Smith, from Co Wicklow, Ireland, dated 23 November 2016. Michael Smith was his grandfather's brother.